I live in Melbourne, Australia and mother to one teenage daughter. I love knitting, but I am also very keen on fitness and eating fresh wonderful food. I try to stay active and you will probably find me at the Pool, the Gym or walking most days. I am interested in social media and online communications – putting the social, into social media! I love the opportunity to share interests and engage with people online. Please don’t be shy, chat with me on Twitter, Instagram or Facebook. Because l love the online community, I will be encouraging WhatJaneKnits kit knitters to share their projects. It’s so great to see what other people have done and let's face it, we all could do with a little more appreciation and praise in our lives! Like many children I learnt to knit via my Grandma and my Mum. It was fun and I think I finished at least one scarf. Then, later in life, when my sister had a baby I knitted some things for my nephew. I discovered a whole new world of gorgeous yarns and fashion colours. Since then I’ve knitted on and off and created a few great wardrobe pieces. I also ran lunchtime knitting classes at my daughters’ primary school for 2 years which was incredibly rewarding. The website I have created is to help beginner and novice knitters create nice things! I love knitting simple yet stylish accessories and garments and I find it so rewarding for these pieces to become part of my everyday wardrobe. Many people are inspired by what they see on the ‘high street’ and in fashion magazines, currently hand knits are all the rage. Unfortunately many of these popular pieces, especially the super chunky knits are quite expensive (really expensive) even though they look simple to create. It is inspiring for a knitter to be able to complete their project before they get bored with it, I hope these knitting kits will be just the ticket. The kits are a great starting point for anyone interested in knitting and also a fabulous gift for your very cool friend! The beginner knitting kits are standard patterns I have re-created using yarn I have sourced within Australia. Delivered to your door free of charge, the kits contain yarn, needles, pattern and a link to a video tutorial specific to your kit. 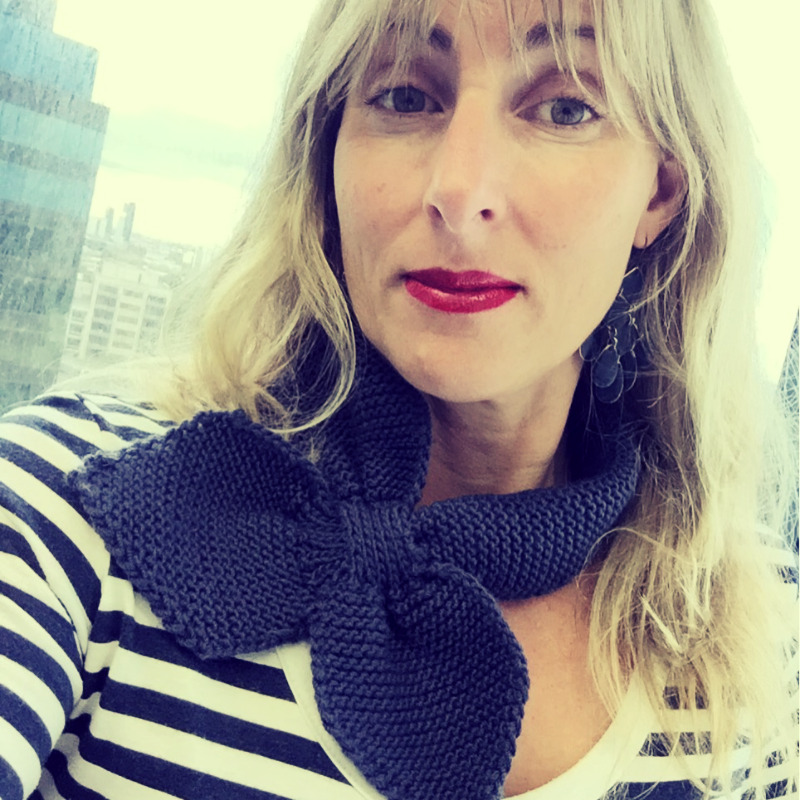 A little bit french in my knitted bow scarf and striped top!